Sometimes you get inspired from the bottom up. As part of a really musical end of summer (4 concerts in 2 weeks), we had the chance to see Clive Carroll at Mississippi Studios (MS). Not only is MS a great venue, but Clive Carroll has become one of my favorite guitarists. We first saw Clive in February as the opening act for Tommy Emmanuel. To be frank, I thought Clive’s set was better than Tommy’s. Both are incredible guitarists, but Tommy was pushing so hard that night that it made it really hard to get into the music. When Clive said he’d be back in Portland for a solo show, I got tickets as soon as they went on sale. 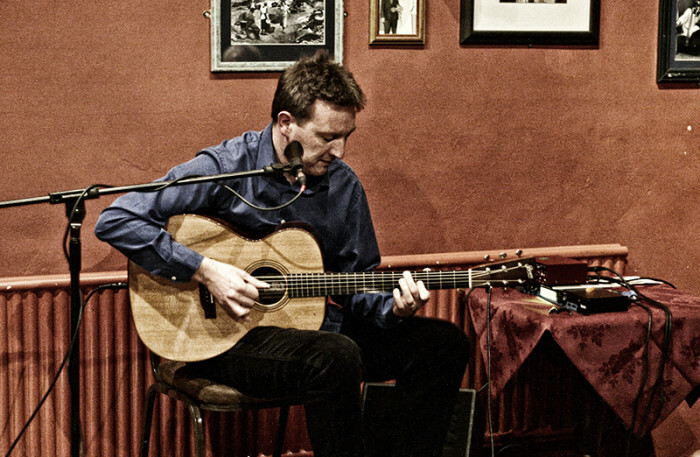 Clive Carroll plays fingerstyle guitar with amazing technical skill, but also with a lot of heart and a very special kind of expression. His work is a mixture of classical, blues, and contemporary guitar styling. He spent a number of years touring with John Renbourn and you can hear that influence in his music, along with influences from many other sources. But this guy doesn’t imitate, except on purpose–his report from the Chet Atkins guitar festival was very funny and musically cool, but his own musical ideas are fresh and very original. One thing that really draws me to Clive’s music is his use of bass notes. He changes tuning a lot, and frequently takes both his 6th and 5th strings down, sometimes way down. I had a chance to talk with him for a few moments after the show and I asked him, “When are you going to stop living in denial and get a harp guitar?” He said he wasn’t sure about that, but we discussed the idea of 7-string or even a baritone. All I can say is that if he shows up next time with a harp guitar, I’ll know why. He will be back in Portland for a guitar seminar in July of 2016, and I am already marking the dates on my calendar. In addition to being an amazing guitarist, he’s a very nice guy. His manner is gentle, almost subdued–but his music carries a lot of power and works its way inside you, as good music should. On the way home from the concert, Debbie asked me if I felt all inspired by hearing such great music. As much as I hate to admit it, there was a moment when I felt so humbled that it was almost discouraging. I thought about how cool it would be to play at MS and then I thought about the level of talent I was listening to, and I started to think that I was lucky just to get to buy a ticket. I want to tour the world and play concerts before cheering crowds. I need to play music live and have people enjoy it. I want to participate in workshops & seminars and help people find new dimensions in their music and their lives. I need to teach people because I like teaching. I want to make my living as a musician. I need to make a living however I can. Q: What’s the difference between a working musician and a large pizza? A: A large pizza can actually feed a family of four. Will I get to play a show at MS, or any other concert venue? I hope so. I keep working toward that goal because I think it’s worth attaining. But will my life be empty and incomplete if I don’t? No. I know that nothing is guaranteed except for 3 things: death, taxes, and spam, and we all have to make the best of whatever comes along each day, or even each moment. Most of all, it’s not the venue that matters. What’s important is that the audience, whoever they are, feels that their lives are a little richer because of the music I play for them or the message I bring to them. It was a big inspiration for me, just not exactly the kind most people think of. Which Number is Smaller 0 or 2 ?